I was recently chatting with a friend. He was bemoaning the fact that the current “hot” steel Rolex were just impossible to get from an AD and were now trading at a substantial premium in the grey market. A steel Daytona 116500 is now fetching $18,000+. I saw the new GMT Pepsi offered at over $20,000. To be honest, it is a little crazy that these new models are at such elevated prices. My reply to my friend was that for that amount of money, he could find a neo-vintage piece (ie something from the last 30 years) that would become a future classic. He then asked me what from the last 30 years I would classify as a future classic. It got me thinking. This post represents the first in a series of posts that will look at just this question. Of limited production thereby making it reasonably hard to find. Supply needs to be of a sufficient number to make the hunt realistic, but hard enough to make it a test. Within a specific reference, there is usually some distinguishing factor that separates one type of dial from another. The rarer the dial variant, the more in-demand it will be. Unique appearance. Take for example the Big Crowns that have clearly recognisable characteristics that make them easy to identify. Similarly, on Milsubs, the marking on the insert makes them stand out as does their military features. Typically, a collectible watch marks something important in the history of Rolex. It is not always the case, but often it can be. Take the Sea-Dweller 1665, for example. The invention of the HEV came with the 1665 and that marked a very significant point in Rolex history and how it subsequently shaped the company. I will start with one that is already starting to become acknowledged as such. In my view, of the Submariners that have been made in the last 30 years, this would be one clear choice for a future classic collector piece. The Submariner 16610LV. The movement in the 16610LV is the 28,800 vph frequency Caliber 3135, with 50hr power reserve. Essentially 100% in-house caliber that has proven itself as totally reliable and sturdy. Indeed, many have argued that it is one of the most reliable calibers ever made by Rolex. It may not be beautiful or refined, but on reliability it reigns supreme. Sapphire crystal, triplock crown and 40mm case constructed from the Rolex patented ultra high grade 904L steel. The watch is built like a tank and is one that is very practical to use, unlike so many of the 50yr+ vintage pieces that are not as sturdy. This is a thoroughly usable neo-vintage watch. What makes the 16610LV different? Firstly, it was an anniversary model to celebrate 50 years of the Submariner. That makes it special to start with. Rolex made the hands fatter and the indexes bigger as a nod to the historical models. Rolex added several further twists to the model such as making the insert in green, representing the heritage colour of Rolex. Unlike its modern day brother, the Hulk, the dial remained black and only the insert carried this colour shift. Enough to make it immediately recognisable but also retaining that Submariner DNA. It also came with gold-surround markers - the aptly named Maxi dial - further distinguishing it from its Submariner predecessors. This style of Maxi dial had first been introduced to the Yachtmaster in 1991. This was the first Submariner to have it. Released in 2003 and produced for a relatively short lifespan of 7 years. However, within these 7 years, the model saw a number of evolutions and it is within these evolutions that desirability evolved. Within these evolutions are the seeds to what makes a great reference a future collector’s classic. A seven year production is not especially long. This is especially so given that Rolex differentiated the dials that were used through this 7 year production. The very first models were produced in 2003q3 on the Y-series. There is no dispute that the Y-series were the very first models of production. These Y series dials have a very specific format that is identical in only the early F-series that were produced from 2003q4 through to 2004q3. These first generation unique style dials can legitimately be called the true anniversary dials. In these specific F and Y series dials, there are a number of features that differentiate the 16610LV from all later production. The following table aims to highlight the general evolution of the 16610LV through its lifecycle. Stretches outside of the 28-32 minute markers. Only dial with marker directly under S and E.
Aligned with right foot of R.
Remains inside the 28-32 minute markers. Aligned with end of left foot of R. But can also be aligned with right foot. Remains inside the 28-32 minute markers. Long minute markers at 28 and 32. Aligned with end of left foot of R.
The position of the words SWISS ONLY falling outside the end of the 28-32 minute markers. All subsequent dials see the words fall within those markers. 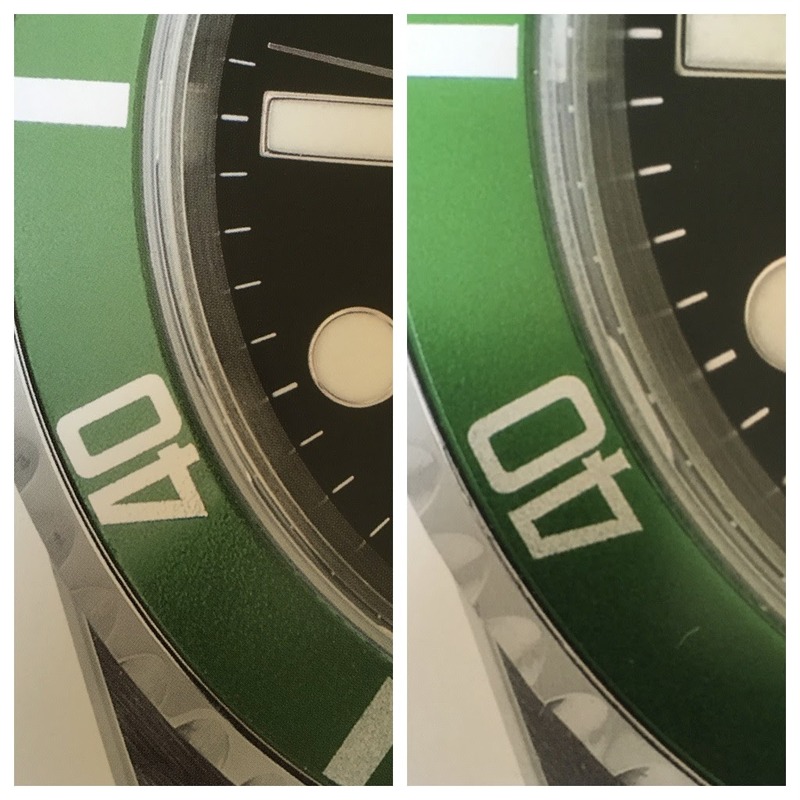 The 4 in 40 on the green insert is a fat 4 rather than the subsequently used thin 4. 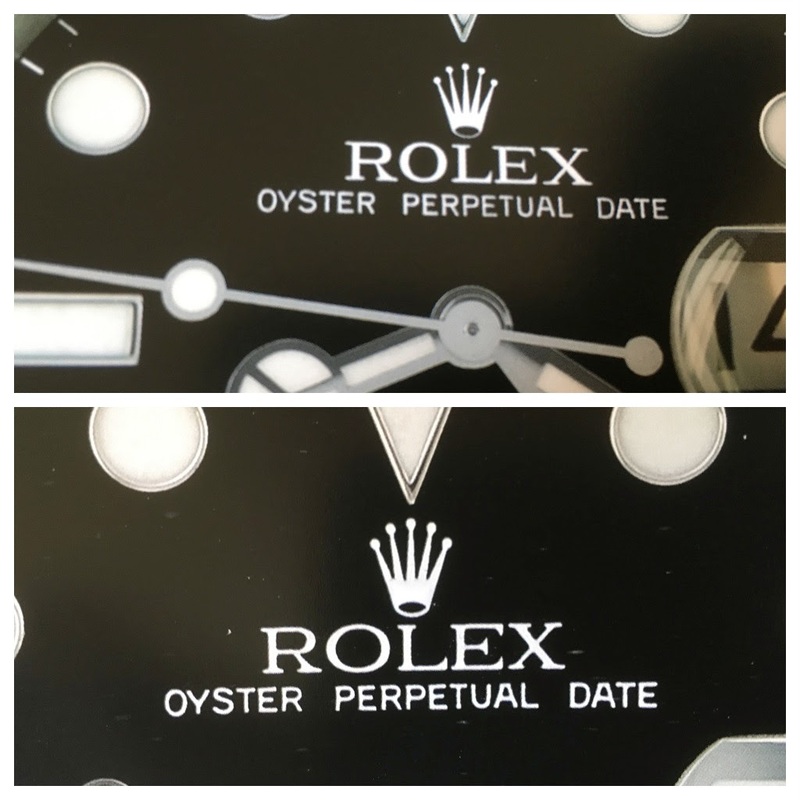 The position of the “r” in Oyster in relation to “R” in Rolex is aligned with the gap between the left and right feet of the “R”. Of the 40 or so Mk1 dials that I have seen, all but one or two conform to exactly the same description as above. I have seen a Mk1 dial with a “Thin 4”. To be honest, I am not sure that I have a ready explanation for a Mk1 dial with a Thin 4 insert. It is possible that an original Fat 4 insert became damaged and was replaced by a later insert. Possibly. The above four factors essentially separate the Mark 1 dial from the subsequent dials. The year of production of Mark 1 dials can be 2003 or 2004, but it is always on a Y or F series. Its possible for a later Mark 2 dial to have an F-series serial number. It would not, however, be possible for a Y-series serial number to come on anything other than a Mark 1 dial. 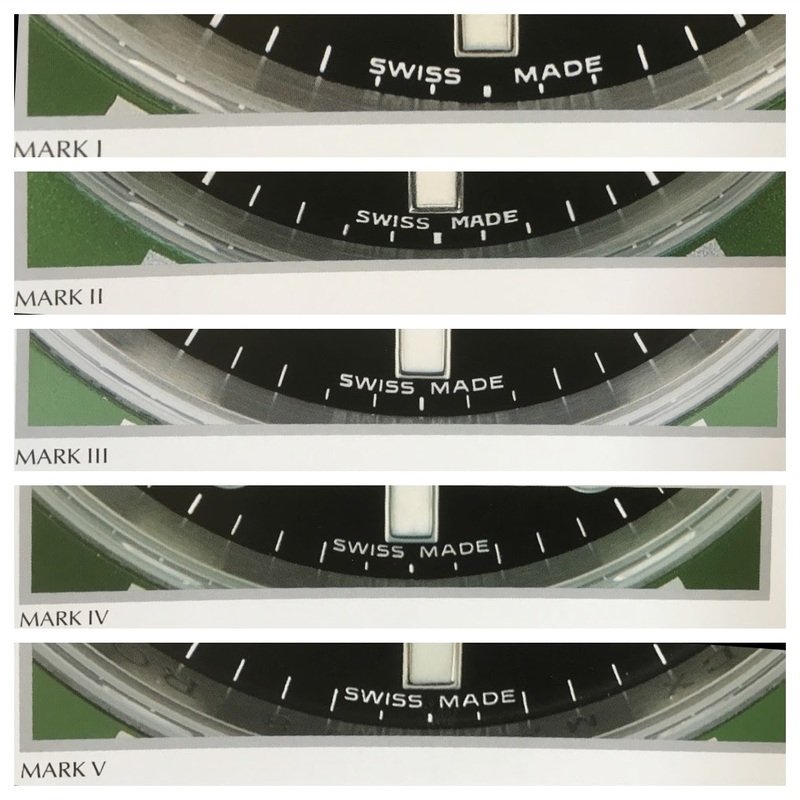 If a watch ticks all of the above four criteria, then it is a Mark 1 dial. The fact that Rolex made these subtle changes to the watch allows collectors to differentiate from the first wave of production of the 16610LV that is what many see as the true anniversary watch and subsequent production. It also pins the period of production of Mark 1 dials down to a 12-18 month period, which for Rolex is incredibly narrow. At the time of production, the watch was met with some scepticism by collectors. It was not a roaring success by any means. However, as time has passed, its qualities have become more and more appreciated. Is the 16610LV the coolest Submariner produced over the last 30 years? Is it the most collectible? I would have to say that it is most certainly in the frame for such an accolade. As a collector, this watch appeals to me a great deal. It has a thoroughly modern and reliable movement. Sapphire glass. It looks different to a normal Submariner. It is very rare in any dial variation. It has that dial evolution that so distinguishes Rolex. It is easy to service. 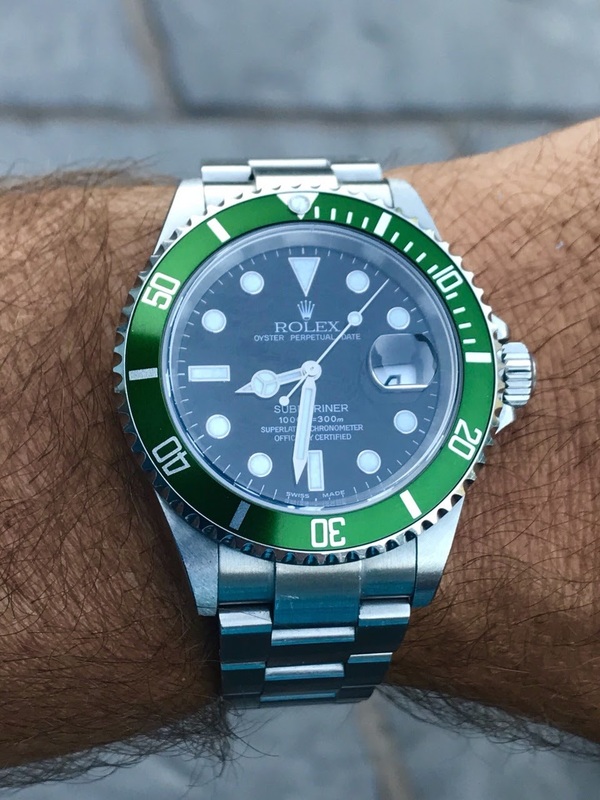 It has a touch of history to it being the first ever submariner with a “Maxi dial” as well as the first with a green insert! Yes, this watch ticks many of the boxes that for me would distinguish a modern but soon-to-be classic watch. It is easy to see how, in 5-10 or so years time, people will be talking about how cheap the 16610LV used to be. If I was choosing, I would naturally gravitate towards a Mk1 dial, but to be honest the production across all dial variations is not enormous and I would be happy with any. Very interesting post and future series. ..... someone should explain that 178 concept to him. I was offered nearly 10 times what I paid for mine the other day so definitely the cat is out the bag. M.
Most probably a champion, in this category. You’ve nailed it yet again Joe. Stop with Rolex collector code words! Fat 4? Round 'O'? etc... My head is spinning. Hulk and Kermit. Makes sense. I don't know whether to quote Walt Whitman or Grand Funk Railroad. One thing is sure, you rascal...Ms Piggy will see what you've posted. And she won't be happy. Very interesting and timely post Joe. Especially for someone like me who is a newbie in the world of Rolex. Sincerely appreciate all your time and effort taken to piece this together! 😃😃😃 I look forward to the next part of this series! .....it really makes sense to look at neo-vintage or transitional models like this. I am awed by your (and others) knowledge of the details of Rolex dials. So far beyond what I can ken. I'll buy new(ish) and hope I live long enough to see it grow in value. In the meantime I do applaud your post. The Sea Dweller for me. Miranda's blew me away. ..... this is the first of a series of 6 or 7. So maybe there will be a modern Sea-Dweller coming. This is what i want to see more in this forum. Quality Post. Good One Baron. Thank you, Baron, for such a detailed and enlightening post to begin this series. Thanks Walter.... but I am Joe. I did suspect that the inserts had been replaced but could not prove it. Also, with Rolex one can never be 100% certain of anything. I agree,100% your statement about Rolex watches, everything is posible! Have a nice day! Thank you for the educational post! for this great post👌👌 Very intersting! Thank you for taking the time to write this excellent article. Before reading it I didn’t realise how many details can change during the lifetime of a specific reference. I thoroughly enjoyed it. .. One of those articles, to be bookmarked and re-read again ! Not only did I enjoy the fine details but also your comprehensive information ! Looking forward to reading your further parts of the Series ! Thank you again € My Very Best, hs. ...to the Rolex experts here. Do you think the same level of future collectability and desirability applies to the last no date Seadweller 116600 in 40mm? Would appreciate your thoughts. Thank you. Thank you very much for this educational post. I think I view the Mk1 and Mk2 as similarly rare and equally collectible. Yes, I think it’s a nice bonus that the Mk1 is the original and the one that celebrated the Sub. If it was me, I would be happy with Mk1 or Mk2. I think this is reflected on the resale sites. Models listed as MK1 are at a significant premium compared to the others. Now I understand. I consider the MK 1 to be the “true “ anniversary model. I always wondered why an anniversary model was produced by Rolex for more than one year. Thanks to this article, I arrived at the conclusion that there was an anniversary model, unknown to me at the time. IMO watches are like financial assets. Current price is determined by the expected terminal value discounted by a certain rate by collectors and would-be buyers. Thanks for this story. It’s definitely very informative.